When we pray to Goddess Lakshmi, we seek her blessings in reaching our life goals with minimal impediments and roadblocks along the way. The most popular imagery of Goddess Lakshmi is of the goddess of abundance depicted by a pot of gold. 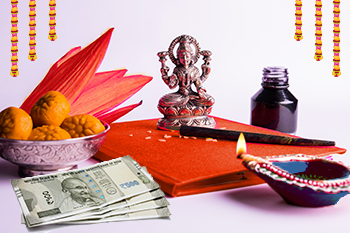 Goddess Lakshmi is also known as the Goddess of Wealth, and Lakshmi Pujan is looked at as praying to the Goddess for wealth and abundance. However, this is a very narrow definition of wealth in this context. Actually, the name Lakshmi comes from the word “Lakshya” or goal. When we pray to Goddess Lakshmi, we seek her blessings in reaching our life goals with minimal impediments and roadblocks along the way. The Sanskrit word for eight is Ashtha, which denotes the eight manifestations of the Goddess. Goddess Lakshmi not only represents material wealth but also represents the wealth of knowledge, courage, and wisdom. Interestingly, each of these manifestations of Goddess Lakshmi has a much deeper significance for our own efforts at investing and creating wealth. This is a fundamental assumption of happiness. You need wealth to take care of the needs of your family and also set aside wealth for a rainy day in the future. The idea of Dhana Lakshmi is not just about instant gratification with money, but putting it to long-term use. This is where our idea of long-term investing comes into the picture. Investors need to ensure that their money works hard for them as that is the only way to sustain wealth. The idea of equity funds and SIPs originates from here. Gaja in Sanskrit means an elephant, and it has dual significance. It not only represents movement or progress but also represents growing wealth since an elephant is an expensive proposition to maintain and a few can afford it. When you are creating long-term wealth, your approach should be to constantly grow your wealth and to adapt to changes. This is what the forward movement of the elephant embodies. Adi in Sanskrit refers to the original or the eternal (never-ending). Wealth cannot be for a short period, and we all yearn for long-term wealth, which we can not only enjoy in our life time but also bequeath for our children. Investing and planning your finances is all about making your wealth last an eternity. This is only possible with long-term planning and by choosing the right investments that can create wealth with the power of compounding. This manifestation of the Goddess talks about the softer aspects of victory. If power alone mattered, great dynasties would have ruled us forever. The point is that fearlessness and determination matter a lot more and can take on the greatest of powers. As an investor, you must be always instilled with confidence to go ahead with your plans, determination to stick to your goals even when the market disappoints, and have the courage to take risk. It is this softer aspect of victory that normally stands by you in tough investment conditions. While Vijaya Lakshmi is a more aggressive manifestation, Dhairya Lakshmi is a less aggressive but equally powerful manifestation of the Goddess. Here, we refer to the wealth of patience and perseverance that stems from conviction. The takeaway for investors is that you need the twin qualities of patience and perseverance to create wealth in the long run. Whether you invest in equities or in mutual funds, wealth is never created overnight. You need to be patient and keep persevering despite repeated setbacks. Hinduism always looked at health as a distinct sign of a wealthy and prosperous person. What use is money and wealth if the person does not enjoy good health? From an investment perspective, this has a larger significance. You not only focus on your own health but also the health of your portfolio. Your portfolio must be in shape and well-balanced to diversify risk and tide over the vagaries of market fluctuations. Hinduism is a religion that treats education as a source of wealth. The belief is that education, skills, wisdom, and discernment can be crucial to enhance your wealth and prosperity over time. Vidya or education is a continuous process. When it comes to your investments and wealth creation, you need to constantly invest in new ideas and knowledge to create wealth. This manifestation is worshipped for its fecundity and fertility. Here, fertility is used in a much broader sense and can be perfectly applied to our investment or wealth creation needs, especially with respect to the power of compounding. Compounding creates money from existing capital and aids wealth creation in the long term, hence, investors should use it to their best advantage.